Traditional British Style Leather In-hand headstall with brass fittings, Supple Buffalo leather, brass cincher brow and noseband, brass Square buckles. DOES NOT COME WITH REINS OR A LEAD OR A BIT. In Hand Show Halter. Black English leather Show in hand halter with brass fitting and brass cincher brow. Complete with matching lead with attached chain. Made in Spain. In hand Show bridle/Halter Quality leather rolled show bridle with plastic metallic piping in gold on nose and brow and brass s fittings. 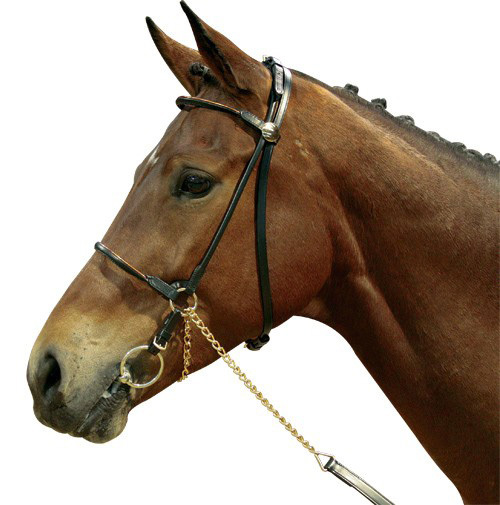 Comes with removable bit attachments, can be used as a halter or Halter bridle. Complete with rolled leather matching lead with chain. Made in Spain $78.00 lead with chain is 7 foot 4 inches. Measurements: COB- Noseband across (end of ring to end of ring) 13". Crown (over head to nose band) Smallest to largest buckle adjustments 27" to 31""
Measurements: FULL/HORSE- Noseband across (end of ring to end of ring) 15". Crown (over head to nose band) Smallest to largest buckle adjustments 29" to33"